Be a current ASCA member. 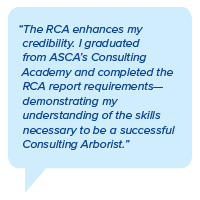 Be a graduate of ASCA’s Consulting Academy. Graduates of ASCA’s Consulting Academy are able to deliver stronger work products after participating in sessions on the principles related to a professional consulting practice, the function of a consultant, best practices for report writing, the dispute resolution process, and the role of forensic investigation. Meet continuing education requirements. You must have earned 420 CEUs to meet the continuing education requirement. A $100 fee is due at the time of application submission. A report review fee of $100 must accompany each report (two reports total). A $50 fee is due each year to maintain your RCA.